Do not use the or position during cooling operation in extremely humid weather. The difference between the temperature of the outside air and the windshield could cause the outer surface of the windshield to fog up, causing loss of visibility. In this case, set the mode selection to the position and fan speed control to the lower speed. right/hot position and the fan speed control to the highest speed. • If warm air to the floor is desired while defrosting or defogging, set the mode to the floor-defrost position. • Before driving, clear all snow and ice from the windshield, rear window, outside rear view mirrors, and all side windows. • Clear all snow and ice from the hood and air inlet in the cowl grill to improve heater and defroster efficiency and to reduce the probability of fogging up the inside of the windshield. Manual climate control system To defog inside windshield 1. Set the fan speed to the desired position. 4. The outside (fresh) air and air conditioning will be selected automatically. If the air conditioning and/or outside (fresh) air position are not selected automatically, press the corresponding button manually. To defrost outside windshield 1. Set the fan speed to the highest position. 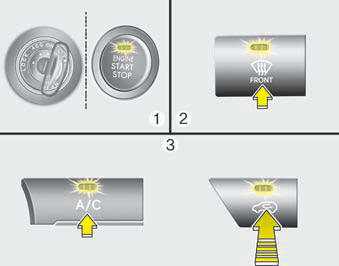 If the air conditioning is not selected automatically press the corresponding button manually. Automatic climate control system To defog inside windshield 1. Set the fan speed to the desired position. 3. Press the defroster button ( ). 4. The air conditioning will turn on according to the detected ambient temperature and outside (fresh) air position will be selected automatically. If the air conditioning and outside (fresh) air position are not selected automatically, adjust the corresponding button manually. If the position is selected, lower fan speed is adjusted to a higher fan speed. 2. Set the temperature to the extreme hot (HI) position. To reduce the possibility of fogging up the inside of the windshield, the air intake or air conditioning are controlled automatically according to certain conditions such as or position.To cancel or return to the defogging logic, do the following. 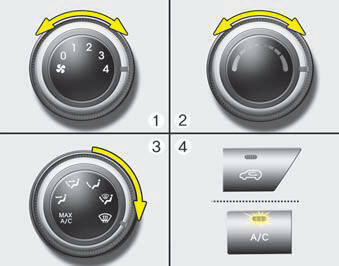 Manual climate control system 1. Turn the ignition switch to the ON position. 2. Turn the mode selection knob to the defrost position ( ). 3. Press the air intake control button at least 5 times within 3 seconds. 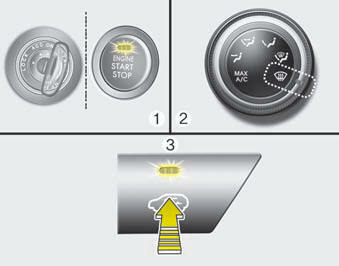 The indicator light in the air intake control button will blink 3 times with 0.5 second of interval. It indicates that the defogging logic is canceled or returned to the programmed status. If the battery has been discharged or disconnected, it resets to the defog logic status. Automatic climate control system 1. Turn the ignition switch to the ON position. 2. 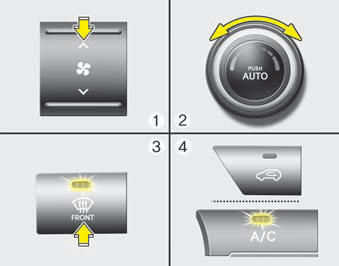 Select the defroster position pressing the defroster button ( ). 3. While pressing the air conditioning button (A/C), press the air intake control button at least 5 times within 3 seconds. The A/C display blinks 3 times with 0.5 second of interval. It indicates that the defogging logic is canceled or returned to the programmed status.